Testimonials are a great way to showcase your experience with pets and make your profile even more attractive to new dog owners. You can reach out to friends, family, or people who you’ve provided pet care for in the past to ask them to write a testimonial for you. You’ll be required to request testimonials when you sign up to be a sitter and once your profile is approved then they will be visible to all on your public profile. The more testimonials you have the better, because these help you build credibility and attract new dog owners. 1. Navigate to your Profile by selecting your name in the upper right corner of the screen. 3. 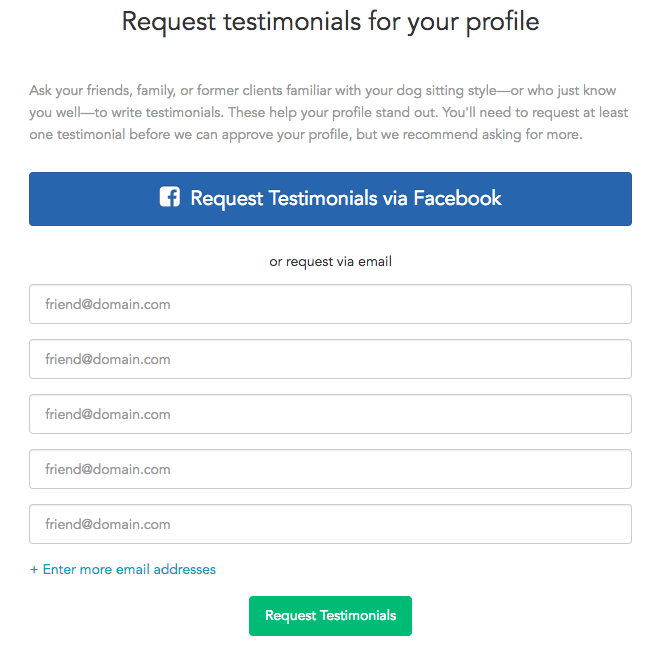 Either enter the email addresses of people you'd like to send testimonial requests to or select Request Testimonials via Facebook. Rover Tip: Make sure to leave no spaces after you enter an email address or you will get an error message. You’re all set—your testimonial requests will be sent.